Shares plunge after its proposed merger is called off. Here's what investors need to know. 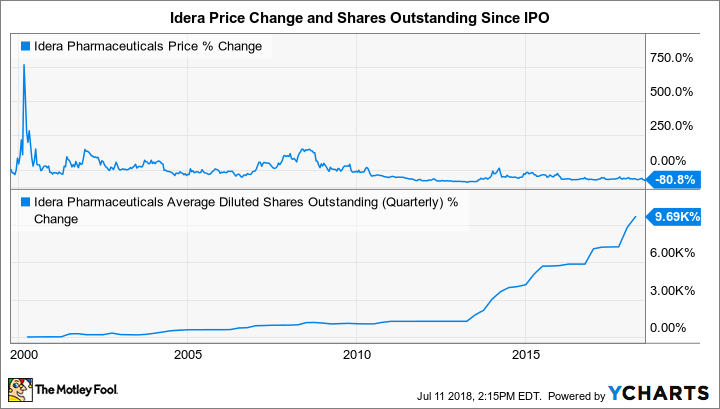 Shares of Idera Pharmaceuticals (NASDAQ:IDRA), a clinical-stage biopharma focused on oncology and rare diseases, fell 16% as of 2:20 p.m. EDT on Wednesday after its proposed merger with BioCryst Pharmaceuticals (NASDAQ:BCRX) was called off. Shares of BioCryst were up about 1% on the news. Idera announced that the merger has been terminated after BioCryst's stockholders voted against the deal in a special meeting held on Tuesday, July 10, 2018. Idera's shareholders also held a special meeting on the same date but they voted in favor of the deal. BioCryst has to pay Idera a $6 million breakup fee in response to their decision to terminate the deal. The Board and shareholders of Idera overwhelmingly supported the proposed merger with BioCryst based on the strategic rationale, operating synergies and opportunity to create a stronger and more diversified rare-disease, focused organization Our tilsotolimod would have been one of the two centerpiece product opportunities of the combined company. As we move forward independently, we will remain focused on the development of tilsotolimod in anti-PD-1 refractory melanoma, a significant unmet need, as well as begin to explore the role of tilsotolimod in improving outcomes in patients suffering from additional solid tumor cancers. While we remain focused on the development of tilsotolimod, if an opportunity arises to further enhance shareholder value and build our company through business development, we will explore it. Idera's stock has been in free fall ever since this deal was announced on January, so it's a bit surprising to see that shares are being whacked yet again on this news. However, the fact that BioCryst's shareholders went out of their way to block this transaction does show that they have little interest in owning Idera's assets. Given the company's track record of value creation, I can't say that I blame them. Since I'm a fan of investing in winners, I have a hard time considering today's drop to be a buying opportunity. For that reason, I'm content to watch this story play out from the sidelines.